The trouble with games is that someone has to lose, but with Peaceable Kingdom's brilliant co-operative games, everyone is a winner, because you all play as a team! In the charming Mermaid Island players help the mermaids swim to their home - but watch out for the mean Sea Witch! Spin, move and pick up a wand to gain the power to defeat the Sea Witch and make it back to Mermaid Island! The game structure encourages teamwork and shared decision-making - the tension builds as the Sea Witch gets closer to Mermaid Island, but everyone is working together to help defeat her! Co-operative games are brilliant for creating social interaction - it's great when the common objective is achieved by everyone, and no one feels left out or left behind. 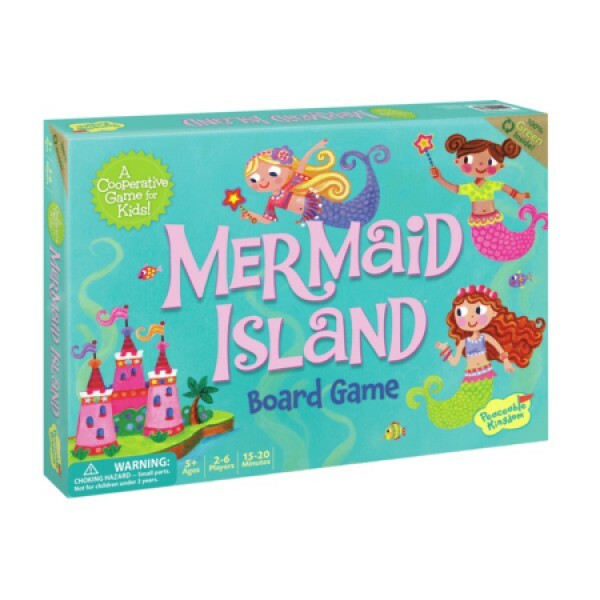 Mermaid Island is an excellent way to improve simple strategy, direction following, social development and cooperation skills.